The Grosse Ile Naval Air Station was officially in operation from 1927 to 1969, however, it had been used solely for classroom instruction as the navy reservists from Detroit had no aircrafts when they first started out in 1925. The very first aircraft they were assigned was a single Consolidated NY-1 and that remained their only aircraft for over a year. In 1927 the base saw an expansion as the state of Michigan purchased 5 adjoining acres and built a large hangar at Olds Bay for seaplane use. It was around that time that an awareness for the importance of aircraft use in war had started to grow, but it wasn’t just awareness that grew, the Grosse Ile Naval Air Base grew as well. On September 7, 1929 it was officially commissioned as the United States Naval Reserve Aviation Base. 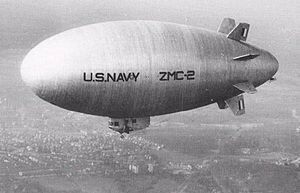 1929 was also the year the first all metal blimp was constructed, coincidentally, it was constructed in the large area surrounding the Grosse Ile airfield by the Aircraft Development Corporation. This all metal blimp, the ZMC-2, was turned over to the Navy later that year and remained with the Navy until 1939 and is still the only all metal blimp to serve in the United States Navy. The 1930’s our nation may have had trouble growing because of the Great Depression, but somehow the Naval Air Base continued to grow. Many reservists at the base drilled without pay, but the Navy squadrons there doubled in size. In 1931 gliders were introduced into the training program by the nearby Curtiss-Wright Corporation which folded within the year. The Aircraft Development Corporation also had trouble securing contracts during this time and had to close. The commander of the Michigan Naval Reserve saw this as an opportunity to gain more land for the Naval Air base and thus, purchased the Curtiss-Wright land as well as, leased the Aircraft Development Corporation’s land. In 1935 runways, taxiways, and roads were all added. This was around the same time that the Federal Aviation Commission recommended an increase in the Naval Air Force. The Grosse Ile Naval Air base was to be designated as a primary flight training base. This would be the first step for Naval pilots before they were sent on to Pensacola, Florida to complete their training. When January 1941 came around, every one of the reserve squadrons stationed at the base were called into active duty. The training quota increased more than tenfold and by August a hundred cadets from the Royal Air Force arrived and Grosse Ile became a leading training center for the whole of the United Nations, which hadn’t, as of yet, been established. Once the United States finally entered World War II, the Grosse Ile Naval Air base saw even more growth. The base expanded to more than twice its previous size, buildings were erected for classrooms, administration offices, simulator rooms and barracks. Three new runways were also put down which are still being used by the Grosse Ile Municipal Airport. They are also quite easily visible from the air as a triangle at the southern end of the island. In the fall of 1942 Grosse Ile was leading the primary training of all the bases in the Naval Reserve. This, among other things such as the quick expansion of the base officially designated the base as U.S. Naval Air Station Grosse Ile, Michigan. By the end of 1944 all of the Royal Air Force cadets were transferred from Grosse Ile and over 800 United States Naval cadets took their place. There were many different aircrafts, stationed on Grosse Ile, among them were the PBY Catalina, F4U Corsairs, SB2C Helldivers and the TBM Avengers. Mainly, however, the cadets trained using the T-6 Texan and the and the Boeing Stearman. Immediately following World War II ended, there were even several squadrons of Martin AM Maulers and very briefly, six FH-1 Phantoms which were the only jets to ever be stationed at Grosse Ile. There were major cutbacks being made in the amount of pilots being trained by every Naval base by the end of 1944. The Navy Air Force was not losing as many pilots as they had predicted and no longer needed as many trainees from any base, including the Grosse Ile Naval Air Station. This caused the station, like many others to become deserted relative to their normal hustle and bustle almost overnight. This may have been one of the reasons one of two Marine Corsairs flew right past the Grosse Ile Naval Air Station to the Air Force Selfridge base North of Detroit (Easter, 2010). After World War II the station became home to 10 Naval Air Reserve Squadrons and one Marine squadron. The end of World War II also gave way to a new era of aircraft warfare. The jet became the common aerial combat vehicle. One of the downsides to these new jets was that they needed a longer runway to land. The runways at Grosse Ile Naval Air Station could not accommodate the longer landing distance. When it was attempted to elongate the existing runways, the residents of Grosse Ile met these efforts with contempt. This is still not the end of the stations usefulness though. During the 1950’s, the station became the training grounds for anti-submarine warfare and this would continue until the closure of the station. The new trainees of the station had access to a new group of planes than those used in World War II. The base now had A-1 Skyraiders, S-2 Trackers,P-2 Neptunes, C-119 Flying Boxcars, and C-54 Skymasters. The A-1 Skyraiders and the S-2 Trackers were used by the anti-submarine warfare trainees while the C-119 Flying Boxcars and C-54 Skymasters were used by the Marine Corp Reserve. 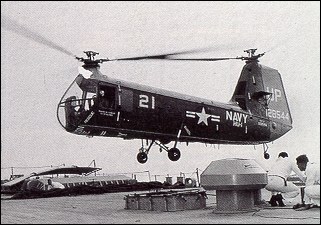 There were also a group of helicopters stationed at the base in the 1950’s including the HUP Retriever that was later replaced by the larger Sikorsky H-34. These helicopters were mainly used for boater rescue missions on the Detroit River and on Lake Erie as there was no Coast Guard station nearby. There was even, at one point, a C-130 that stopped to update their flight plan on their way to Pensacola. It was a fond memory of Clem St. Louis who almost did not realize that he was not being asked how the weather in Pensacola was as a joke (Louis, 2010). 1956 saw the arrival of the United States Army to the Grosse Ile Naval Air Station. They came to install three Nike Ajax SAM’s in an attempt to protect Detroit in the event of a strategic Soviet bombing. This site was never upgraded to the nuclear grade Nike Hercules and was closed in 1963. When closed, the Nike missile site was converted into a conservation area and a bird sanctuary controlled by the United States Fish and Wildlife Services. The 1960’s saw almost as much action as World War II at the Grosse Ile Naval Air Station with 2000 Naval and Marine Reservists training there. Many of these trainees would be serving in Vietnam. The aircraft used by the Navy remained the same as in the 1950’s, however, the Marines changed to the OV-10 Bronco. In 1964 it was announced by the Department of Defense that the Naval Air Station would be closed in 1967. The station prolonged its closure 2 years longer than expected, but it was closed at the end of 1969 seeing its last graduating class of trainees in November. The duties and squadrons of the station were moved to the more accommodating Selfridge Air Force Base, which is now known as Selfridge Air National Guard Base, located to the north of Detroit. Directly after its closure, the station was turned over to the Township of Grosse Ile. They transformed it into the Grosse Ile Municipal Airport and continue to use many of the buildings. The buildings previously used for barracks, classrooms, administrative offices and simulators were all razed. The original Curtiss-Wright flying school hangar is still in use today, although it is mainly used as housing for civilian aircrafts and as a dance studio. What was formerly Hangar 1 is now used as the Township Hall and offices. The original tin hanger that was floated in the Detroit River is on land and unavailable to the public, but still standing and under the control of the United States Environmental Protection Agency. 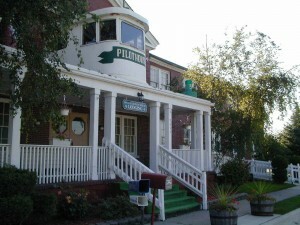 The Curtiss-Wright barracks is currently Named the Grosse Ile Pilot house and is used for both long and short-term guest lodging as well as private dinners, dances, weddings, and banquets (Curtis, 2017). There is also a museum showing the history of the naval air station. 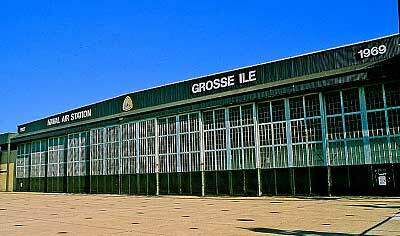 Home of Naval Air Station Grosse Ile Virtual Museum (2013).